Archaeologists from Aarhus University in Denmark and The Danish Castle Centre have made a sensational discovery south of Copenhagen: A massive Viking fortress built with heavy timbers and earthen embankments. The Viking fortress is over 1000 years old, and it’s the first to be discovered in over 60 years. The fortress is perfectly circular and is similar to the famous “Trelleborg” fortresses built by King Harald Bluetooth around the year 980, which have been nominated for inclusion in UNESCO’s list of world heritage sites. Søren Sindbæk, professor of medieval archaeology at Aarhus University, has researched Viking fortresses for years and says, “The discovery has been a piece of detective work. We suspected that one fortress was ‘missing’ on the island of Zealand. The location at Vallø was quite the right setting in the landscape: in a place where the old main roads met and reached out to Køge River valley, which in the Viking Age was a navigable fjord and one of Zealand’s best natural harbors. 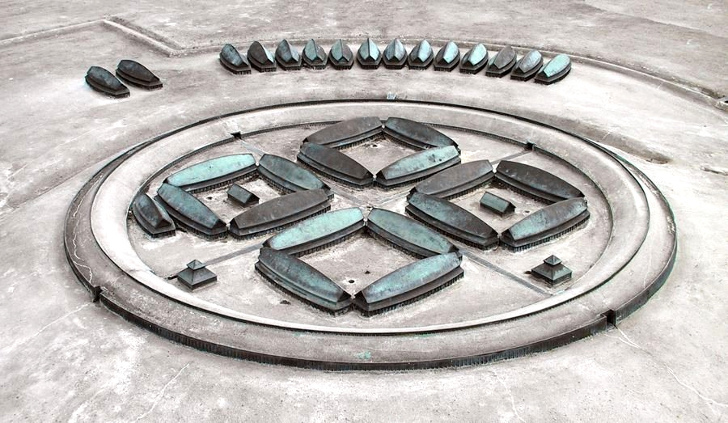 From there we worked our way forward step by step.” The fortress site is about 40 miles south of Copenhagen. Related: Vikings Built This Amazing Green-Roofed Village 1000 Years Ago! It was new, precise laser measurements of the landscape that then led curator Nanna Holm on the trail of the fortress. An almost invisible rise in the targeted field was shown to have a clear circular outline. Holm explains: “It is a huge monument. The fortress measures 145 meters (476 feet) from side to side. We recognize the ‘Trelleborg’ fortresses by the precise circular shape of the rampart and by the four massive gates that are oriented at the four corners of the compass. Our investigations show that the new fortress was perfectly circular and had sturdy timber along the front; we have so far examined two gates, and they agree exactly with the ‘Trelleborg’ plan. 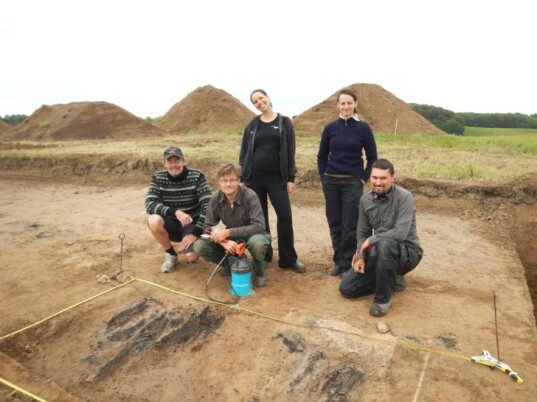 It is a marvelous find.” The team were aided by Helen Goodchild, an expert in archaeological geophysics from the University of York in the UK, who performed detailed measurements that helped to identify old pits and embankments. The technique revealed a surprisingly detailed image of the fortress in just a few days, so the team knew exactly where to dig the excavation trenches without destroying valuable evidence. Holm stresses the fortress was a genuine military facility, and probably the scene of fighting as well. She’s in no doubt that it dates back to the Viking Age: “Fortresses built like this one were only built in the Viking Age, and the burnt timber in the gates enables us to fix the date using radiocarbon dating and dendrochronology. We’ve sent off samples for analysis, and the result should be available in a few weeks’ time. The date will be vital. If we can establish exactly when the fortress was built, it will help us to understand the historical events with which it was connected.” She adds: “We can’t wait to find out whether the fortress dates back to the time of Harald Bluetooth, or whether it was built by a previous king. A military fortification from the Viking Age may shed more light on the links between Zealand, ancient Denmark and the Jelling dynasty – as well as teaching us more about the period during which Denmark became Denmark.” Stay tuned! Archaeologists from Aarhus University in Denmark and The Danish Castle Centre have made a sensational discovery south of Copenhagen: a massive Viking fortress built with heavy timbers and earthen embankments. The find marks the first Viking fortress to be discovered in over 60 years. The fortress is perfectly round and is similar to the famous “Trelleborg” fortresses, such as the one pictured here, built by King Harald Bluetooth around the year 980, which have been nominated for inclusion in UNESCO’s list of world heritage sites.